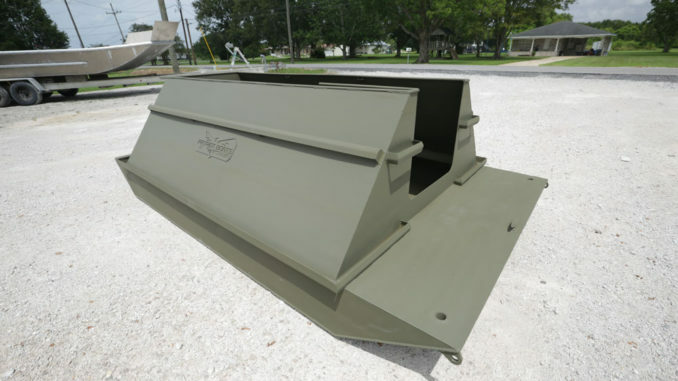 Tired of fighting the mud and the muck to rebuild your duck blind every couple years? Patriot Boats in Chauvin has exactly what you need. Their floating blinds, built on Patriot’s boat platform, not only offer a great place to hunt, but the blinds are mobile — allowing you to move with the birds all season long. Custom options are available, but Patriot offers both 8-foot and 12-foot models. All blinds come with two spud poles and a camo canvas cover, plus shelves inside for hunting gear and cup holders for that early-morning coffee. Basic models come with olive paint. The 8-foot model can hold three hunters comfortably, and costs $4,500. The 12-foot model seats four to five people, and costs $6,500. Camo paint and hydro turf flooring are available at an additional cost. For more information on blind options, call Brooks Pellegrin at 985-594-5832, or visit www.jandbmanufacturing.com.